Peter Davison, known to viewers of Georgia Public TV as "Dr. Who" and also as Tristan on "All Creatures Great and Small," will be featured on a special GPTV broadcast from the Dixie Trek science-fiction convention next month. The British actor will be a guest speaker at Dixie Trek, which is being put on by the Atlanta Star Trek Society May 2-4 at the Sheraton Century Center hotel. 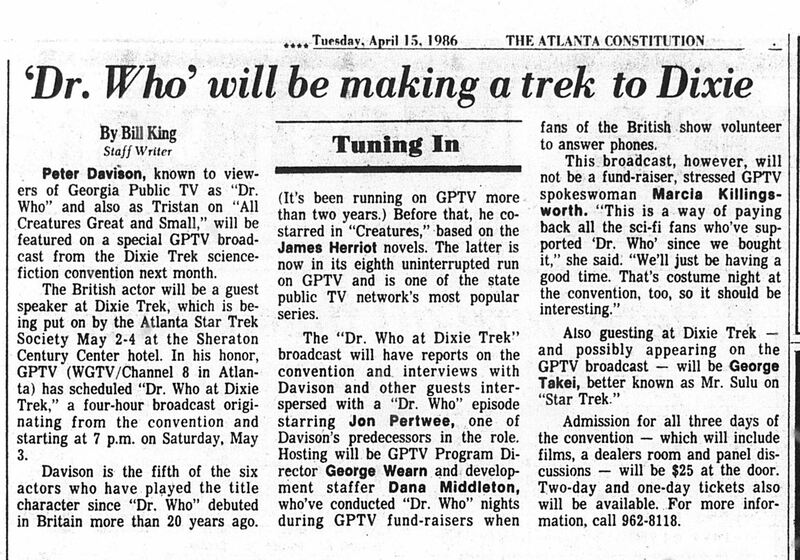 In his honor, GPTV (WGTV/Channel 8 in Atlanta) has scheduled "Dr. Who at Dixie Trek," a four-hour broadcast originating from the convention and starting at 7 p.m. on Saturday, May 3. Davison is the fifth of the six actors who have played the title character since "Dr. Who" debuted in Britain more than 20 years ago. (It's been running on GPTV more than two years.) Before that, he co-starred in "Creatures," based on the James Herriot novels. The latter is now in its eighth uninterrupted run on GPTV and is one of the state public TV network's most popular series. The "Dr. Who at Dixie Trek" broadcast will have reports on the convention and interviews with Davison and other guests interspersed with a "Dr. Who" episode starring Jon Pertwee, one of Davison's predecessors in the role. Hosting will be GPTV Program Director George Wearn and development staffer Dana Middleton, who've conducted "Dr. Who" nights during GPTV fund-raisers when fans of the British show volunteer to answer phones. This broadcast, however, will not be a fund-raiser, stressed GPTV spokeswoman Marcia Killingsworth. "This is a way of paying back all the sci-fi fans who've supported 'Dr. Who' since we bought it," she said. "We'll just be having a good time. That's costume night at the convention, too, so it should be interesting." Also guesting at Dixie Trek - and possibly appearing on the GPTV broadcast - will be George Takei, better known as Mr. Sulu on "Star Trek;" Bill Mumy, who played Will Robinson on "Lost in Space" back in the '60s; John Nathan-Turner, producer of "Dr. Who" for the past five years; and Atlanta resident Michael Forest, who played Apollo on the "Who Mourns for Adonis?" episode of "Star Trek" and also guested on the original "Twilight Zone" and "Outer Limits." Admission for all three days of the convention - which will include films, a dealers room and panel discussions - will be $25 at the door. Two-day and one-day tickets also will be available. For more information, call 962-8118. APA 6th ed. : King, Bill (1986-04-15). Dr. Who is to make trek into Dixie. The Atlanta Journal-Constitution p. B9. MLA 7th ed. : King, Bill. "Dr. Who is to make trek into Dixie." The Atlanta Journal-Constitution [add city] 1986-04-15, B9. Print. Turabian: King, Bill. "Dr. Who is to make trek into Dixie." The Atlanta Journal-Constitution, 1986-04-15, section, B9 edition. This page was last modified on 21 December 2014, at 19:10.